Well if you are looking for something different in the Out-Of-Home Entertainment sector here, then MoCap Games has something to show off next month in Hong Kong at the Asian Attractions Expo 2012. I’ve seen this company wandering past their booths at different shows like IAAPA where they were demonstrating some of their unique systems, although I have to admit that I didn’t spend a lot of time looking into what they had to offer which had to do with direct motion capture translated into a real-time virtual environment. Their newest system that will be shown off in greater detail is called Sci-Shoota. The only details I have on it at the moment are found below in the press release, which the impression I am getting here is the next step beyond laser tag. We will know for sure within a few weeks and this won’t be limited to a specific region like Asia from what I know, as I mentioned they show up at different trade shows around the world so we will be seeing these systems out West too. [May 21, 2012, London, UK] A brand new immersive entertainment system will be launched at the Asian Attractions Expo (AAE) 2012 in Hong Kong next month. 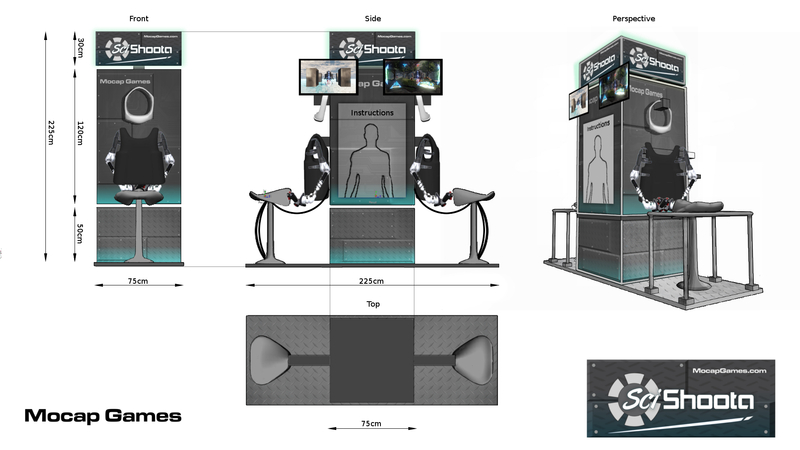 ‘SCI-SHOOTA’ made by Mocap Games is the first of its kind – a next-generation Virtual Reality Entertainment (VR-E) system that will be launched on booth 2618. To be seen by some 4,500 of the expected industry professionals from around the world, attending the sold-out AAE 2012 trade exhibition. Mocap Games: ‘SCI-SHOOTA’ is the first in the series of VR-E action content for this ground-breaking platform – a system combining the three essential elements of Immersive Display, players Body Tracking, and a competitive (and addictive) Game experience – in a package for the Digital Out-of-Home Entertainment (DOE) market. The Mocap Games system has been developed to be placed in a variety of facilities including theme parks, family entertainment centers and retail environments (see rendering). Launching the Mocap Games: ‘SCI-SHOOTA’ at the Hong Kong AAE 2012 event, will mark the beginning of a brand new generation of immersive, real-time, entertainment systems that place the player literally in the game; and offering a level of experience that cannot be achieved on any other type of home or amusement systems; the development of immersive entertainment driving the emergence of the DOE market internationally. With this ground-breaking system players will be able to be fully immersed in a competitive game with fellow players within the virtual environment. The latest immersive reality entertainment technology deployed in this unique platform – Mocap Games using the company’s exclusive motion capture suit to represent the player’s movements in the virtual world; a high-fidelity system ideal for application in the public-space. I think I want to make a game similar to that except that I will most likely call it Sci-Tekken or something like that. How’s that sound? Perhaps you are thinking of something similar to this? That model looks like she’s just stepped out of Accident & Emergency!! I think a Kinnect approach would be a better idea – less parts for customers to break! @RJAY63, the mechanical motion tracking is more accurate than what could be achieved at the moment with KINNECT – while visual trackers are good, but not in Public-Space application (look at KDE’s ‘Dance Evolution Arcade’ and the problems they have had) – and they do not have a HMD. Good tracking is essential to achieve a good immersion for VR-E games. The Animazoo tracking system offers a compelling experience – though in this first game (Sci-SHOOTA) only the top (upperbody) tracking is used.